Andi B. Goode: A Swingin' Safari! For some reason this suit makes me think of A Swingin' Safari by Bert Kaempfert, hence the title of the post. I wore this out to dinner for my sister's partner's birthday, last night...I was going to wear a dress but I just had one of those days where it felt like far too much effort to wear one! So, I finally got to wear my pant-suit. Outfit details: head-scarf - actually a belt and it belongs to my mum; 1940s rayon pant suit - Red Ruby Vintage; shoes - KMart. After I bought the suit, I found this image from My Vintage Vogue and thought it was a rather happy coincidence, I suppose. I'd also like to say that today my thoughts are with one John Lennon as it marks the 29th anniversary of his untimely passing. R.I.P. My favourite band is The Beatles and they've had a huge impact of my life and I still find John Lennon to be a big inspiration to me. It looks slightly 70's in a good way. I suppose things like this show just how much the 70's, and 80's looked to the 30's and 40's for inspiration. Pantsuits were made for you! Or you were made for pantsuits? Looks so good! You look like you just stepped out of a classic movie! :) So, so cute!!! I just love it, Andi! 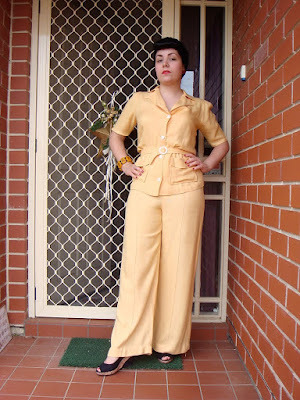 Reminds me of a 40s 'Siren Suit' (I'll send you a link to the picture it makes me think of in a sec). xoxo. Great outfit, you look very elegant. I think seeing that photo of you has me think that i've got to get me a pant-suit! What a fun and exciting outfit! it suits you lovely! I adore this! great post too by the way. AMAZING suit. love it! perfect for a job interview! Andie, you should have a little slideshow of all the geat outfits you have ! I really like those songs too, the originals or no! Oh wow!! That suit is amazing! What a great find!! 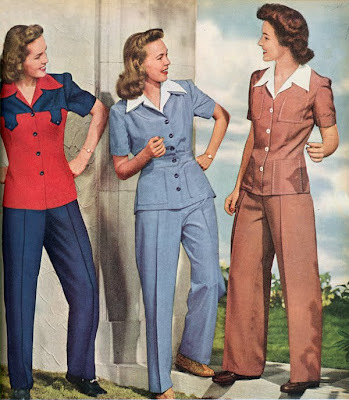 You look so fantastic, I've always wondered how these classic leisure suits (from vintage catalogues) would look on a real live gal these days, and as you've shown us here, the answer is positively wonderful! Super inspiring, Andi, thank you!!! I love your pantsuit! And isn't it amazing seeing contemporary photos of stuff that looks just like something you actually own? I get a lot of peace from "Imagine," especially as a secular humanist. That song sums up so much of my beliefs. This is my favorite blog post of the day. That pant suit is outSTANDing! Thanks for juxtaposing it with the vintage ad; that gives it some context. Miss Emmi: Aw, thanks doll. I'm glad you said that - yellow is one of my favourite colours to wear! Casey: Aw, thank-you. That's so sweet. 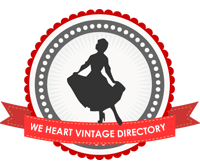 Baroness: Thanks for the link - that's awesome! Nancy: Thanks. I know - vintage just fits so much better. Stefanie: Thanks, hun. I'm glad I inspired you! Jenny: Thanks. =] Haha, they do! Jen: Thanks! I know...I feel lucky. I've never come across anything else like it. Jessica: Thank-you! You always leave the sweetest comments. Catherine: Thanks =D Yeah, it's great. I feel the same about 'Imagine'...whenever it plays I feel a lot calmer.